Excerpt of an interview with film composer Dwight Scruggs. Harry Alan Potamkin: How did you get involved with Omicidio? Dwight Scruggs: I was sort of the third-string staff bass player at Stax. Just bumming around the Memphis music scene, pick-up gigs, jamming, stuff like that. Stax was a shadow of its former self at the time. They’d barely resumed operations after a couple of years of nothing. Somehow they got the idea to sign this Italian progressive rock group, Omicidio. When Stax flew them over from Rome, their bass player couldn’t get through customs. Something about involvement with the Red Brigades. I heard a rumor that he was involved in sending a mail bomb to a federal judge. But I don’t know the details. The other guys didn’t say much about it. But they liked the way I played, so they hired me. They didn’t speak much English and I didn’t know any Italian then, so we mainly communicated by jamming. A couple of weeks after I joined up with them, we got a call from Enzio [Lovitz, producer]. I guess one of Enzio’s granddaughters was a fan of the band. Enzio wanted to surprise her by having them score one of his movies. Stax was up for anything at this point. 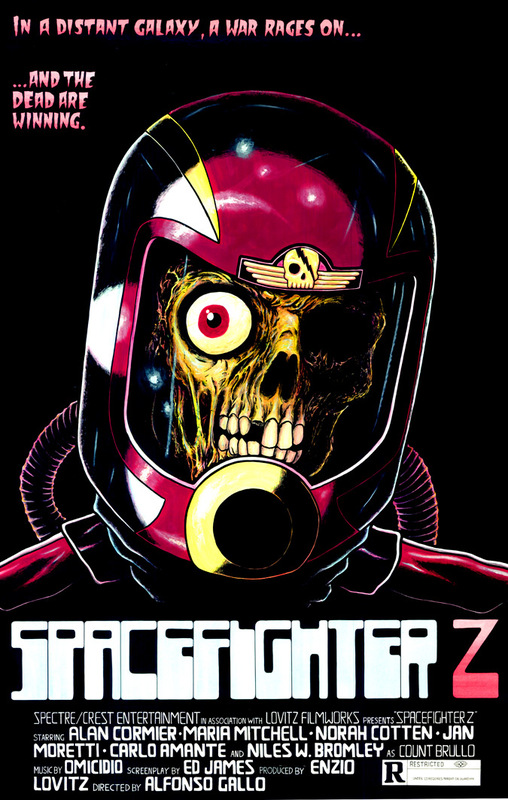 Harry Alan Potamkin: The troubled production of Spacefighter Z is the stuff of film legend. What do you recall from your time working on the project? Dwight Scruggs: Well, I didn’t have much to compare it to. Everything really just seemed kind of normal to me. I had always heard stories about how crazy things could get in the film business, so when I saw Ed [James, screenwriter] and Enzio having writing meetings that seemed to be more about prostitutes and cocaine than an interplanetary zombie rebellion, I figured it was just business as usual. I can tell you, though, that we all had a really great time working on Spacefighter Z. We were like a big family. I mean, I didn’t realize at the time that the composer generally didn’t get involved until the film was completed, or at least practically completed. I was around a lot, hanging out on the set, goofing around with the tech guys, you know, all sorts of stuff. Lots of fun movie business stuff. Working on film scores always seemed more like a regular job compared to that. A good job. A fun job. But not like the Omicidio days at all. Harry Alan Potamkin: How did Omicidio approach the scoring process? Dwight Scruggs: We’d just watch dailies and jam. We recorded everything. We gave the tapes to some weird guy who worked for Enzio. I guess he’s the one who edited it into something like a score. And, I mean, let’s be honest here. It’s really pretty bad. I cringe when I listen to it now. It calls up some great memories, but I’ve learned so much since then that it just seems really half-baked. I guess we weren’t really trying very hard, to be frank. It wasn’t really all about the music when we were working on Spacefighter Z. So it’s really surprising to me how famous and influential that score has become. I mean, Jerry Goldsmith told me that it inspired his music for Outland. It’s just one of those strange things. Harry Alan Potamkin, Spacefighter Z. BFI Modern Classics, 2002. 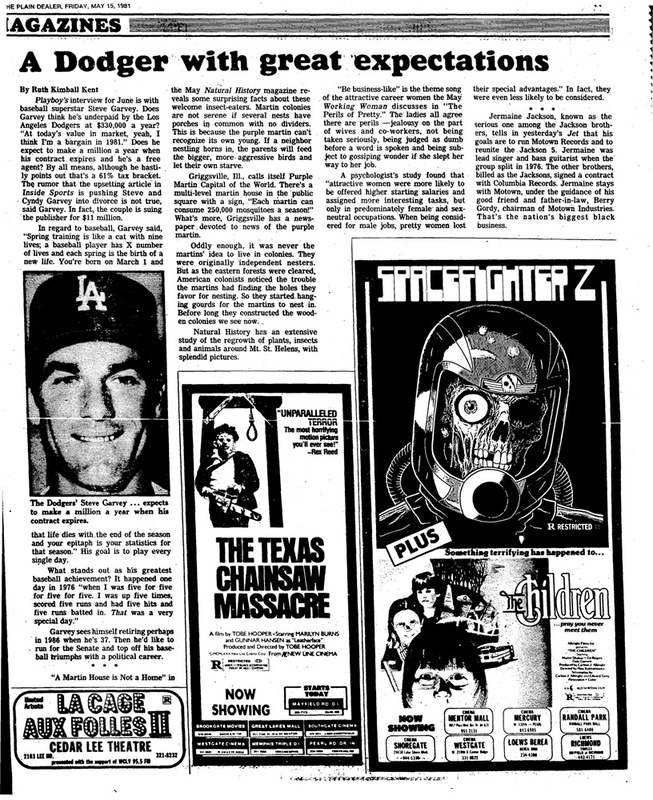 Clipping from The Plain Dealer, Friday, May 15th, 1981.